After our perusal of a since-demolished pub called The Junction, I thought we could stop by this street corner, where Bright Street meets Salisbury Terrace, another junction, not far away. A long walk across York on this day ten years ago took us through this part of the Leeman road area, where there’s a shop on the corner. I’d been struck by the interesting-looking building opposite — St Barnabas Church Hall. The photo above was included on that old page, but only in a very small version. Because back then most people didn’t have fast broadband connections and so photos on web pages were smaller. A lot has changed since then, and not just in terms of assembling web pages for you, dear readers. 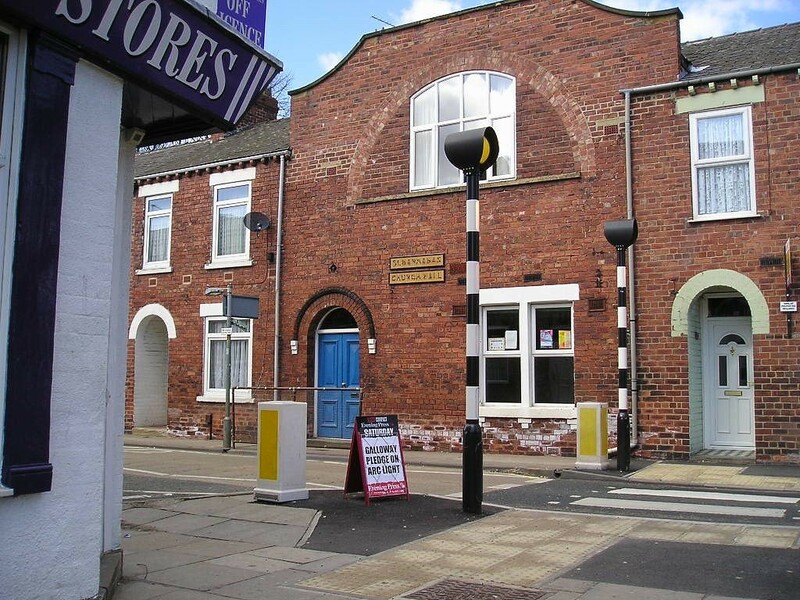 Some Googling for information on the church hall pictured tells me that it’s now called the Barnabas Centre and is run by a church group, but not the established church (which is represented locally by St Barnabas’s church, not far away). As far as I know the corner shop, Leeman Stores, is still there, or was last year when the Google Street View cameras captured it. Presumably it’s well-used and profitable, as it has survived when so many other corner shops haven’t. The fact that there isn’t a Tesco Express or Sainsbury’s Local in the area might also have something to do with it. The other thing I notice about the photo above is the A-board advertising the local Press, with that day’s headline. I took a closer photo of it too, zooming in. This was presumably because it mentioned something of significance and interest at the time, a long-running controversy. Our local press was still at that point called the Evening Press, though the A-board poster emphasised that it was the ‘compact’ version of it, reduced from its earlier broadsheet size (and its previous title of the Yorkshire Evening Press). I wonder how many daily copies were sold in 2006. I wonder how many daily copies are sold now. Not many, probably. On that day ten years ago it proclaimed ‘GALLOWAY PLEDGE ON ARC LIGHT’ — referring to council leader Steve Galloway and the highly controversial issue at that time, where the new Arc Light Centre would be built. At a full council meeting last week, leader Steve Galloway, pictured, pledged to defend “minorities” from the “forces of the Right” and continue the consultation process. The Press archives include many stories on this issue (see ‘More information’, below) – a reminder of how difficult it was to find a site for the new Arc Light centre. At the time of the above photo the Arc Light occupied the Bullnose building at the end of Leeman Road, near the NRM, opening there in 1999. In 2004 it celebrated its 5th anniversary with a get-together in the Junction pub further down Leeman Road (demolished). I’m not sure if anyone’s occupying the Bullnose building since the Arc Light left and moved into its premises on Clarence Street. According to press reports back then it too would be demolished, when the work on York Central got underway. Since then the Bullnose building has been recognised as having heritage value. Will that protect it from being demolished? Perhaps not, as this area doesn’t have a good track record. So many other things in the Leeman Road area have been demolished, including the old foundry buildings in the industrial area, the old school building in the residential area, and the Junction pub. But, thankfully, not the old church hall, pictured above. Reading about that has sparked further thought, more connections. (It’s all connected.) I was completely unaware of the plans to convert it to residential accommodation, but today found an article from June 2008: Community hope for church hall. It made me think of the current debate and discord over Groves Chapel. Both cases involve a church group wanting to keep a building for community use. Clearly the Youth With A Mission (YWAM) group succeeded in their negotiations with the parochial church council of St Barnabas Church, and now own and occupy the building. The Hope Church haven’t given up their campaign for Groves Chapel. The difference there is that Groves Chapel has been in the ownership of the NHS Trust, which has different priorities. Mainly a duty to get as much money as possible from the sale of any assets. And whereas the St Barnabas Church Hall was well-used by the local community, it has been decades since Groves Chapel was used by anyone other than the NHS. The self-contained nature of this area almost effortlessly creates a sense of identity – the name Leeman Road is used locally to describe the whole residential area, not just one street. … Salisbury Road, Salisbury Terrace and Kingsland Terrace, to me were ‘Leeman Road’. I suspect it has something to do with the one-way system, and the fact that I knew this area from childhood, going through it as a passenger in the family car, from the Water End junction, through the fairly wide Salisbury Road and then into the much narrower terraced Salisbury Terrace, then turning right towards Leeman Road, going under the railway bridge, then turning a sharp left towards town. It felt like one road. But it isn’t. Roads often travelled, many years ago, as a child, as a passenger in a car, but only a few times on foot as an adult, in the 21st century. It’s an interesting area, which I might write about again. For now, this page is long enough. Just some thoughts prompted by one ten year old photo of a street corner.